My mom, Lynette Louise aka The Brain Broad, grew up in a family that was often abusive and almost as often ill. She was aware that somehow she was different than anyone around her, and doctors visits for constipation sometimes turned into questions about possible mental illness diagnosis. None of the labels stuck, but the memories and confusion did. How could she be the one that was mentally ill when it was the adults who smacked and screamed? At a young age mom became interested in (if not obsessed with) discovering where psychology ended and physiology began. It is this interest of mom's, coupled with an insatiable love for the seemingly unlovable, that makes her such a unique and effective brain expert, neurofeedback practitioner, and play professional. It is also why her newest podcast, The Brain Broad Builds A Brain, promises to be enlightening, fun, surprising, and smart! For her new podcast The Brain Broad (my mom) finds guests that have been instrumental in developing heretofore unknown or unexpected solutions to either their own brain story or the stories of their patients. They then challenge themselves to "Build A Brain" by pondering a new way to approach a disorder, chosen randomly from the DSM V (the diagnostic and statistical manual of mental disorders). In this way the listener becomes privy to brain facts as well as the creativity inherent in finding answers. Eventually gifting the audience with the confidence and brain science to begin the art of building their own brain comfortably. Lynette Louise aka The Brain Broad (aka my mom!) is an avid sharer of information. She travels the world as an expert and works with clients in their homes. She writes books and articles, speaks and performs (offering her one woman musical comedy show Crazy to Sane free every April--Autism Awareness month) and hosts the fabulous international reality series FIX IT IN FIVE with THE BRAIN BROAD now showing on The Autism Channel. Her already popular podcast A NEW SPIN ON AUTISM: ANSWERS! brings insights and ideas to families and professionals in the world of autism every other Monday. In truth Lynette hopes to share herself out of a job! 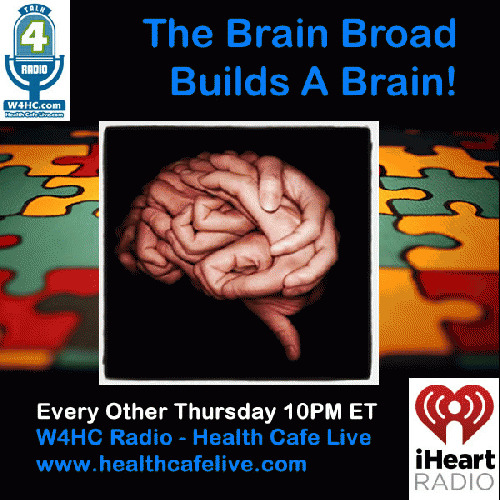 Listen to The Brain Broad Builds A Brain every other Thursday at 10 PM ET on W4HC Radio, Health Cafe Live. Join my mom and her guests as they dive into the always fascinating workings of the brain, its connection to so much in the body, the questions of psychology and physiology, and the sadly misunderstood world of mental illness. As an international mental health expert and autism specialist, my mom is passionate about teaching and learning with a fun flair and intimate honesty. Everywhere she goes in the world she meets families struggling to help each other, and doing more than most could imagine to make it happen. The love she has for these families comes through loud and clear in her approach to discovering answers. Join The Brain Broad every other Thursday and consider adding your own ideas to the conversation.